US President Donald Trump’s campaign did not conspire with Russia during the 2016 election, according to a summary of Special Counsel Robert Mueller’s report submitted to Congress on Sunday. The report summary did not draw a conclusion as to whether Mr Trump had illegally obstructed justice – not exonerating the president. Mr Trump, who repeatedly described the inquiry as a witch hunt, said on Sunday “it was a shame that the country had to go through this”, describing the inquiry as an “illegal takedown that failed”. “The Special Counsel therefore did not draw a conclusion – one way or the other – as to whether the examined conduct constituted obstruction,” the letter reads. Mr Barr says the evidence is not sufficient “to establish that the president committed an obstruction-of-justice offence”. Mr Barr ends his letter to Congress by saying he will release more from the full report but that some of the material is subject to restrictions. “Given these restrictions, the schedule for processing the report depends in part on how quickly the Department can identify the [grand jury] material that by law cannot be made public,” he writes. 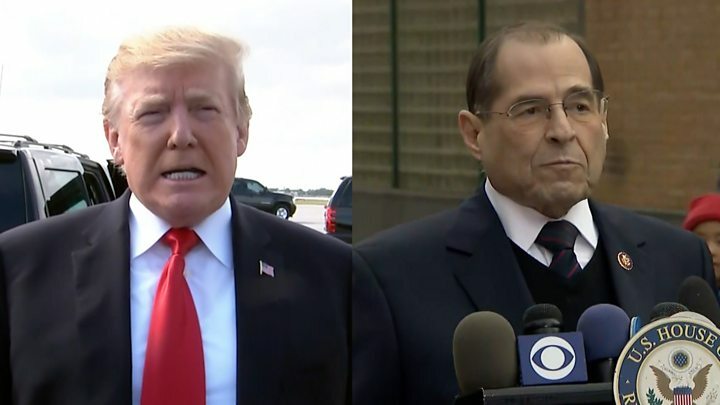 Congressman Jerry Nadler, the Democratic Chair of the House of Representatives Judiciary Committee, emphasised the attorney general had not ruled out that Mr Trump might have obstructed justice. The committee’s Democratic chairman, Jerry Nadler, said on Twitter that he would ask Mr Barr to testify “in the near future” over “very concerning discrepancies and final decision making at the Justice Department”.